Once you get the hang of it, these are super easy to make, but I have to be honest, it was not a cute scene to begin! Every time I thought I was getting somewhere with my braid, I would not hold on to it tight enough, I could loose control, it would come loose and I would have to start over! Argh. It was perrrrrrty frustrating! Heres what you have to do, secure the loop to something that will not move. Don't judge, I used my foot. It was perfect! I could control it so well and it helped me keep the braid straight as I continued along. Alright, now that you know my dirty little secret, lets move on, maybe you'll forget I used my foot! Ha. • Mason Twine ($5.21) (Approx. 2 feet- I was too lazy to find a ruler, so I just measured the distance from the tip of my middle finger to my elbow, it works just fine!). Cut the twine into 3 equal length pieces and tie a loop with a knot to hold them all together. The loop will help you secure the twine while you get working. Braid until you have about 6 inches of braid. During the entire process of braiding the nuts in, it is extremely important that you keep a thumb at the base of the braid to keep it from coming loose or undone. Begin braiding in the nuts. When you are at a point when it's time to cross the far left piece over, thread a nut onto the far left piece before you cross it the left strand over the middle strand. Firmly push the nut against the base of the braid, and crossover. Keep your thumb on the braid to keep everything in place. Thread another nut on the far right piece of twine before you braid it over middle, push it against the base of the braid and crossover. Again, hold your thumb tightly against the base of the braid, keeping the nuts in place. Continue threading the nuts on the far left and far right pieces of twine, holding your thumb at the base and pushing the nuts up and firmly into place. Keep on keepin' on until you have your desired amount of nuts braided into the twine. Braid 3 inches of braid on the other side of the nuts. Thread a jump ring on the far left pieces of twine. Wrap the piece of twine the jump ring is on around and around the braid, towards the hex nuts, about 5 times. Loop the twine around and through and pull tight. Hook the end of your chain into the jump hook. Close up the chain. At the other end of the chain attach another jump hook, but make sure your Snap hook that you bough will be able to fit in it. I stretched out my normal jump hook like crazy. Trim the extra twine. 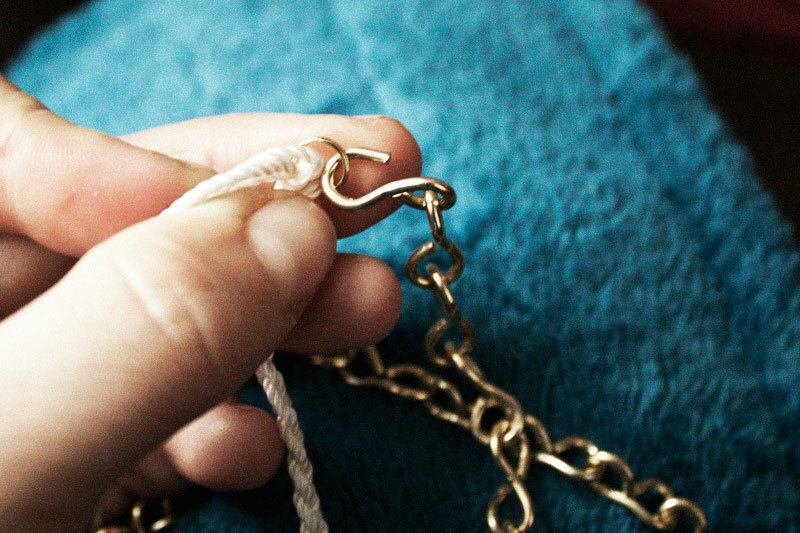 Using the lighter, melt the ends of the string to prevent fraying. On the other end, without the jump ring you just secured, loop the braid into the snap hook and tie a knot. Necklace- CHECK! Now, lets make a matching bracelet (its super easy, promise). Tie a knot with a half-inch loop at the end of the 3 pieces of twine. Braid 3 inches of twine. Braid in all the nuts like mentioned above, then follow it with another braid, as long as you like. This bracelet should wrap around your wrist 3-4 times, so stop when you see you have enough. Loop the washer to the end of the braid like mentioned above for the jump ring for the necklace. Done and done! We have a beautiful necklace AND bracelet for around $20! WOW! I gave this set away for the holiday, but I wil be making myself a new one, with NEON twine! Can't wait to show you! What do you think? ... going to start making yourself some jewelry with Home Depot supplies! ?